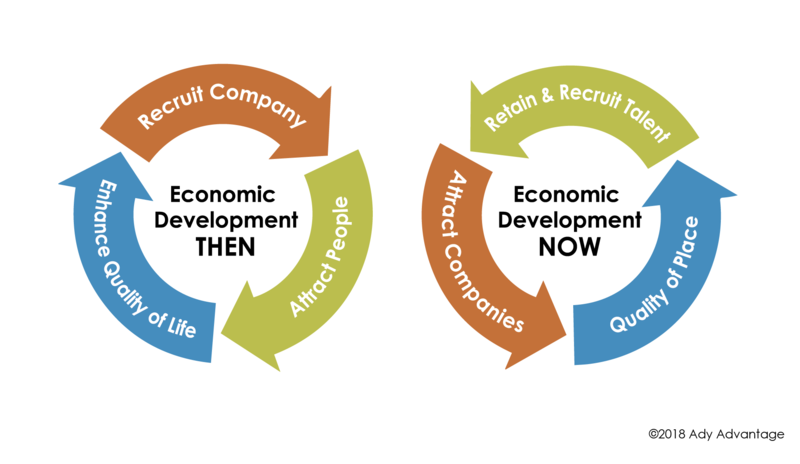 With that comes many implications, one of which is a trend toward increased community alignment, since no single organization can impact all the factors that influence talent attraction, retention and development. This community alignment can be focused along a spectrum of potential behaviors ranging from the coordination of specific programs across different organizations up to and including to organizational mergers. Multiple organizations offering talent initiatives. With the increased focus on talent, many organizations are rightfully being more proactive about offering more programs. In many regions, multiple organizations have some role in talent — and, by extension — quality of place, including not only the EDO and municipalities, but also the Chamber, CVB/Tourism, Main Street, etc. Investors — especially private sector ones — are demanding more accountability. They experience investment requests from multiple organizations and often the programs or outcomes from one organization seem similar to those from another. In addition, employers are under increasing pressure to retain and attract talent, the deficiency of which is a major barrier to their own growth. We are seeing many examples of employers wanting to understand how organizations are working together to solve the big challenges, such as talent. As a result, it’s often the companies themselves that drive change among the organizations. Overlapping missions. As each organization has tried to address the unmet needs that it sees, especially with regard to talent and placemaking, programs can be developed that at best are not as well communicated among stakeholders, and at worst are redundant or even, inadvertently, at cross purposes. Efficiencies and synergies are greater because of the shared awareness of various programs and initiatives combined with clarity on roles and expected outcomes. Does this sound like something that would benefit your community or region? If so, give us a call and we’ll share our thoughts on best practices based on recent projects we’ve been involved in. More importantly, we’ll discuss what this might look like for your community or region. 1. Recruit more trainees: A region can document regional reshoring and FDI. By making clear that mfg. is coming back, recruitment will be improved. 2. Prove competitiveness: MSSC (Manufacturing Skills Standards Council) offers an index that compares each state’s rate of credential issuance to its number of mfg. workers. Ady Advantage has developed a proprietary database of talent strategies that includes these strategies, as well as many others. The point is to understand your region’s goals and talent assets/deficiencies, and create your portfolio of strategies accordingly.